2 Bedrooms, 1 Bathroom, Sleeps 2 - 6 persons. Were celebrating our Anniversary and ONE HUNDRED TWENTY FIVE (125) 5-STAR REVIEWS !. 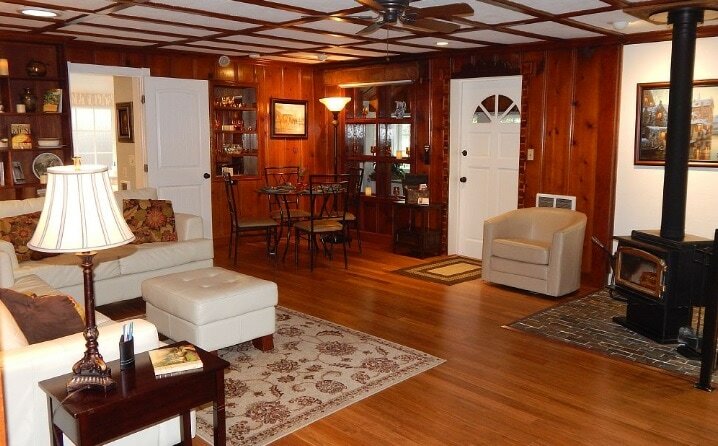 The GINGERBREAD HOUSE is Julian's HIGHEST RATED Vacation Rental. Thank you so much! Gingerbread House has 2 Bedrooms, 1 Bathroom, and Sleeps 2 - 6 guests. Come experience the enchantment of The Gingerbread House. The beautiful Ornate wood carvings you will discover throughout this home were created by John Henry Montgomery. Henry spent the final 20 years of his life making this house into a home by creating the detailed woodwork and ornate carvings on display both inside and outside The Gingerbread House. Mr. Montgomery loved working with wood. We are told: Each day John created wonderful details, ornate corbels and detailed carvings using his small wood-shop located a short distance from the house. The 1934 Gingerbread house was his life. John painstakingly carved, salvaged and recycled all the wood and detail used in this beautiful Austrian style home. The ornate nearly ten foot (10') Wolf-Dragon (see photo) found outside the guest bedroom was his final creation for the Gingerbread house before he died. It was designed to be a bird feeder. Property is in a heavily treed neighborhood, with Cleveland National Forest nearby. This exposure to nature has a wonderful relaxing effect. MINUTES from the turn-of-the-century town of Historic Julian Founded in 1870, enjoy clean mountain air, forests teaming with wildlife, crisp clear night skies. The Cleveland National Forest, Heise State Park, Cuyamaca State Park, shopping, dining, Gold mine and museum tours, Hiking, fishing and picnicking at Cuyamaca Lake. If you enjoy fishing... Fish for Florida bass, Small-mouth bass, trout, crappie, bluegill, channel catfish, and even white sturgeon (Yes, Cuyamaca lake has sturgeon! ); picnic on Fletcher Island; go boating; or just take in the peaceful surroundings from the comfort of the The Gingerbread House! You can go horseback riding, visit the Wolf Preserve, Dudley's Bakery, go wine tasting at over 40 area wineries, night-time stargazing tours (reservations needed). Jess Martin Park is located ¼ mile from town. It offers barbecue pits, picnic tables, playground equipment, a skate-park, baseball fields, a paved walking path (3 laps=1 mile), and a great outdoor fitness center for daily workouts. Experience colorful Daffodils & Lilacs in the spring, star gazing in the summer, apple picking in the fall, or sledding in the winter. Julian Apple Festival in September/October; and, of course... Apple Pie. The Gingerbread House... Enjoy crisp mountain air, forests teaming with wildlife. Where Deer, Hawks, Blue Jays, Woodpeckers, Red Foxes, Silver Foxes, Bobcats, Hummingbirds, Polts, Wild Turkeys, occasional Bald Eagles soaring above, Owls, Orioles, migratory ducks & geese, may be seen nearby or on the property... If you're into wildlife watching and/or photography, this is a great place for both! Gentle snowfall in winter months. Brilliant fall colors, cool spring temperatures, summer warmth, and cold mountain spring water! Close to everything in southern California, yet quiet and distant from the noise and traffic jams of the city. Crisp, clear night skies display millions of stars and shooting stars, a family get-away that's great for the kids; or a quiet, secluded romantic honeymoon hide-away... The Gingerbread House. a. Luxurious New Frameless Glass shower. b. One-of-a-kind Jacuzzi-style Claw Foot tub to soothe, hydro-jets massage and provide relaxation. c. Floor to ceiling mosaic Greek-marble and glass communicates beautiful opulence. d. His and her's Granite counter tops with under-mount sinks. e. His and her closets. f. Instant hot-water dispenser installed for your hot drinks and tea. g. Not to mention, there is a blender. Enjoy new hardwood floors in the living room and bedrooms. The Foyer and kitchen have 3"x5" hand cut slate pavers. There is a Wood Burning Stove with decorative Gold plated door that will not tarnish. The original petrified wood and stone floor has been preserved. It's wrap-around windows and beautiful granite counter tops offer a bright cool refuge for relaxation, crafts, games and your office. Discover The Gingerbread's Beautiful Arbor garden. The Arbor Garden marks the entrance to a beautiful grassy atoll surrounded by seasonal flowers giant shade trees and evergreen soft Vinka ground cover. The Arbor Garden leads to The Courtyard where outdoor bubbling water, steam and massage jets of the Caldera Spa is located. Submerse yourself, relax, and let any problems simply melt away. Home sits on a spacious, corner lot with Circular driveway providing convenient transportation arrival and departure. Parking is provided for a MAXIMUM of 4 vehicles. THERE IS NO PARKING ON THE NEARBY STREETS. New Samsung upscale full size Front load Washer and Dryer. New Gamers TV Stand and new 50” HDTV 3-D television... New 2.1 Dolby/DTS Sound System. New Blu-Ray player... Plays 3-D Blu-Ray, Blu-Ray, as well as traditional DVD’s. Seven (7) pairs of 3-D glasses are included. Our guest travelers may choose their 3-D Blu-Ray Movies (no charge). Movies will be delivered to guest on day of check-in. we have a wide selection of CURRENT and JUST RELEASED 3-D Blu-Ray DVD MOVIES. Availability is on a First come first served basis. Includes a new HD DVR (Digital Video Recorder) to record your favorite shows and Sporting Events! Reception is setup and available at no extra charge throughout home. a. Outdoor gas BBQ is available for your culinary enjoyment. b. The private deck is located off Master bedroom. Deck overlooks mature Oak, Pine, and Cedar trees as well as the beautiful Arbor Garden. c. New deck swivel rocking chairs with slate table provide comfort, convenience and night-time stargazing through the trees. Provides climate controlled comfort throughout the house. Your private HORSE-DRAWN CARRIAGE and Driver will arrive to pick you up at THE GINGERBREAD HOUSE. Upon town arrival, Carriage Driver will wait up to one and a half (1.5) hours while your party enjoys many activities Julian has to offer (shopping, dining, tours, wine tasting, etc.). After enjoying the town carriage will return you to The Gingerbread House. A reservation is required prior to your arrival at The Gingerbread House. Prior to your arrival, we provide LINEN SERVICE. It is determined by the number of REGISTERED Guests in your party. Your registered guests determine the correct number of beds to be made-up with linens, sheets blankets and pillows. Additional towels are also provided based on the number of registered Guests in your party. You must be at least 25 years of age in order to make a reservation. Otherwise, please contact us prior to making a reservation. NO SMOKING or PETS allowed in the house or anywhere on the property. Prior to making a reservation please state in writing to us... If there is a special event or group gathering function planned and if any additional persons (other than registered guests) will be invited during your stay. NOTE: WE DO NOT PROVIDE FIREWOOD. We DO provide one (1) DuraFlame Log and a lighter for fireplace. Outdoor fires are strictly prohibited. Come discover the allure of this Historic, inviting and Luxurious cottage. 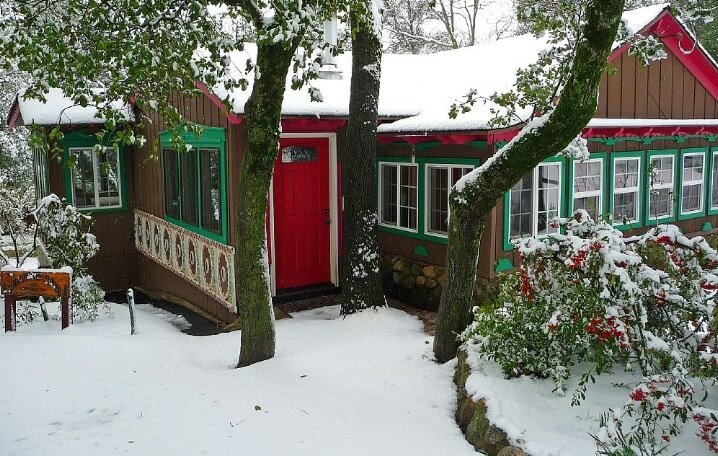 ​Make The Gingerbread House into your home during your visit to beautiful Julian CA. ​Julian is a small mountain community in Southern California located at the intersection of California highways 78 and 79, about 50 miles northeast of San Diego. This historic gold-mining town is nestled among oak and pine forests between the north end of the Cuyamaca Range and the south slope of Volcan Mountain. Julian has four moderate but distinct seasons with average annual precipitation of 30 inches. Cool springs and falls contrast with hot days and cool nights during summer and occasional winter snowfall from December to March. Various climates, from desert to high mountains, exist within 25 miles of Julian.